WIRELESS READY. Yes, Via Ethernet Cable. Optical drive disk trays have been tested. Computers have been cleaned inside and out. OPTICAL DRIVE. All hard drives have been fully wiped and tested. There is a small dent on one side of the case, but barely noticable. 2 x 600GB SAS HDD, 2.5". 1 x CP400i hardware RAID card. 1 x Dual-core i3-6100 CPU (3.70 GHz, 2 cores, 4 threads). 1 x 8GB DDR4 ECC unbuffered. BIOS warning about non Fujitsu RAM. No rails, sold as seen. 2x 450w Power Supplies. Server Accessories. Helpful Links. What Makes Us Different?. 2X QUAD-CORE 2Ghz 64-bit Processor ( 2x Installed) E5405. 32Gb ram (MADE OF 8X 4GB ECC RAM). Serial numbers : All relevant serial numbers are logged in a data base, we also use warranty stickers where appropriate. The servers' screw-less chassis and new hard disk quick-release capability also make it ideal from the ease of use and serviceability perspective. Transfer data with seamless, cost-effective connectivity. 8GB DDR2 RAM (4x 2GB). 4 x 2.5" SAS Hard Drive HDD Bays. 1 x DVD ROM Drive. 1 x ATI FireMV 2200 128MB Video Card 375-3545-03. 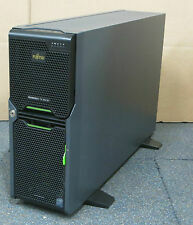 Fujitsu Celsius R920. Quadro 4000. Any hard drives (if included) are data wiped and work. Powers up to BIOS fine without any errors or passwords. We are able to source hard to find parts for Legacy systems through to the latest new in box parts for the latest generations of servers & storage systems. Hard Drives / Bays - 6 x 3.5" SAS Bays - 2x 73GB 15K 3.5" SAS Hard Drives Included. Optical Drives - DVD RW. 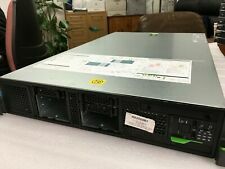 FUJITSU PRIMERGY RX100 S7 1U RACK SERVER - REFURBISHED CPU RAM 1 x E3-1220 4GB HDD 2 x 500GB SAS 2.5" RAID CONTROLLER YES BACKPLANE OPTICAL MEDIA DVD/RW PSU 2x PSU RAILS Not Included CONDITION: The Server Unit is in good condition with some signs of use where it has been installed and then de-racked, any marks are cosmetic and do not effect functionality The Unit comes in brown box with UK power cable. Motherboard - D2939-A17 GS2. Hard Drive - 6 x 3.5" SAS Bays UNPOPULATED. Model: TX2540 M1. Includes Fujitsu On-site Warranty Until 12/01/2018. 1 x Pair Of Rails. Includes Rails. Hard Drive - 1x 300GB 10K SAS 2.5" Hard Drive 7x Empty 2.5" SAS Hard Drive Bays. 4GB RAM (6 Free Slots). Includes Rails. 8 x 3.5" SAS Drive Bays. 1 x Floppy Disk Drive. 8x 2.5" SAS Hard Drive HDD Bays. 1 x Fujitsu LPE12002 Dual Port Fibre Channel HBA With 2x SFP. 1 x Fujitsu D2735-A12 Dual Port Gigabit Ethernet Card. 8GB DDR3 RAM (4GBx2). CS 198153 -server 198154 -rails. Tower Server. TH 195790 AP. In Full Working Order. Processor Speed. POWER CABLE INCLUDED. Used, tested, in working order and good condition, slight marks. Number of Serial Ports. Number of VGA Ports. Number of Ethernet Ports. Number of USB 2.0 Ports. 128GB Ram Server. Hard Drive - 4 x 2.5" SAS Bays UNPOPULATED. Has Dent On One Side Of Lid. TH 198499 see RJ for cpu/ram. In Full Working Order. New opened box server. Chassis type Tower. SUSE Linux Enterprise Server 12. Univention Corporate Server 4. Microsoft Hyper-V Server 2016. Microsoft Windows Server 2012 R2 Datacenter. Microsoft Windows Server 2016 Datacenter. Model: RX600 S1. 4 x XEON (2.50Ghz) - SL6Z2. 2Gb RAM (1Gb x 2). RACK MOUNT HANDLES SEEM LOOSE. In good condition and in full working order. 6 x SCSI Hard Drive Bays. Floppy Disc Drive. Fujitsu RX200 S7. 32GB DDR3 RAM. Server Solutions. 2x Power supplies A3C40121110. 2 x 2.10GHz 6 Core E5-2620 v2 CPUs. Credit or Debit Card accepted Worldwide. All refurbished hard drives are data wiped to NCSC standards. Optical Drives - DVD RW. Hard Drives / Bays - 6 x 3.5" SAS Bays - 6x 450GB 15K 3.5" SAS Hard Drives Included. Lid Not Locking In Place. CS 198122 198132 - server 198123 198133 -rails. 1 x Pair Of Rails. 3 x LPE12002 Dual Port 8Gb Fibre Channel HBA With 2x SFP. Hard Drive - 4 x 2.5" SAS Bays UNPOPULATED. Optical - DVD Multi Recorder. Tested to power on, boots to bios, unit is in good condition. Does not include Power cable,Monitor,keyboard or mouse. Ref: Fujitsu. · Mouse/Touchpad. CELEBRIUM TECHNOLOGIES LTD.
And in TX300 S6 servers. RAID Card D2616A22 with full height bracket. 8 x 2.5" drive cage C26361-K835-B276 with 2 x A3C40086493 4 port backplanes. Tested and in Full Working Order. 12GB RAM (6 Free Slots). Rails Not Included. In Good Condition. 4 x 500GB 7.2K SATA DRIVES. 16GB RAM (4GBx4). DVD Multi-Recorder Drive. All Other Standard Specifications. Model: TX2540 M1. Hard Drive - 4x Empty 3.5" SAS Hard Drive Bays. P/N: ABN:K1463-V101-2. Form Factor: 2U Rack. Rack Rails. Tested - 12 months warranty. USB Ports: 10 x USB 2.0. 2 x CPU Heatsinks (no CPU's). Cooling Fans: 5. Electrical Frequency: 47 to 63 Hz. Motherboard: D2939. Model: TX1310 M1. Hard Disk Drive Storage: 2TB (2X1TB DRIVES). Manufacture: FUJITSU. Machine Type: SERVER TOWER. 16GB (1X16GB) 2RX4 DDR4-2400 R ECC. New Pulls from new servers. product number. In good condition and in full working order. 12 months warranty. DVD 4x Bay Server. Optical - DVD Multi Recorder. Small Dent On Cover Of Lid. Hard Drive - 4 x 2.5" SAS Bays UNPOPULATED. 24GB 438GB 2U Server. Raid: 1 x Fujitsu PCI-E SAS/ SATA RAID Card 3GB/s 512MB Cache - D2516-D11 GS 1. Motherboard: D2619-A14 GS3. Optical Drive: DVD ROM. Enhanced performance compute for various workloads is assured with fast processors. - RAM Installed: 8GB DDR4 SDRAM ECC. - Hard Drive: 2 x 1TB SATA 6Gb/s 7200 rpm. Upon receipt of your order you will be asked to sign for the goods received in good condition. Enhanced performance compute for various workloads is assured with fast processors. RAM: 8GB DDR4 SDRAM - ECC. Hard Drive: 2 x 1 TB - SATA 6Gb/s - 7200 rpm. Warranty (Parts-Labour-Onsite) 1 Year On Site. 4 x 3.5" HDD CONFIG, NO HDDS INC. - BRAND NEW, VAT INC.